Homeowners can learn the correct procedure for controlling woody invasive plants with the cut stump treatment method—a simple way to control woody invasive plants. An herbicide solution is applied directly to the stump top immediately after cutting down the plant. What is a cut stump herbicide treatment? Cut stump herbicide treatment is a simple way to control woody invasive plants. An herbicide solution is applied directly to the stump top immediately after cutting down the plant. The herbicide kills the stump and prevents new growth that would normally occur after cutting alone. 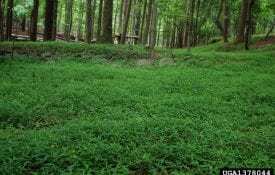 Is a cut stump herbicide treatment the best option for my situation? Cut stump treatments are most useful where the target tree or shrub density is relatively low, manual labor is available, and dead standing trees and shrubs are not desired. This method can be used selectively with no damage to surrounding vegetation. Cut stump treatment is not recommended where thousands of stems per acre need to be treated or where trees or shrubs cannot be safely felled and piled if needed. Cut stump treatments are an effective method for woody invasive plant control. For what size woody plants will this method work? The cut stump treatment method is effective on almost any size woody invasive plant including large woody vines. However, small stems less than a half-inch in diameter are not consistently controlled. What is the best time of year to use this method? Cut stump treatments can be done almost any time of the year with most woody invasive plants. While late summer through fall is often the optimal time, late fall may be the easiest time from an operational standpoint. Temperatures are cooler, herbaceous vegetation is dormant, and undesirable critters are less active. The only time cut stump treatments should not be done is in the early spring when trees are experiencing strong upward sap flow. This is evident when stumps appear to “bleed” water following cutting. For larger stems, you typically need a good chainsaw, although a lightweight brush saw is fine for smaller stems. A handsaw or pruning shears are adequate for smaller stems as well. 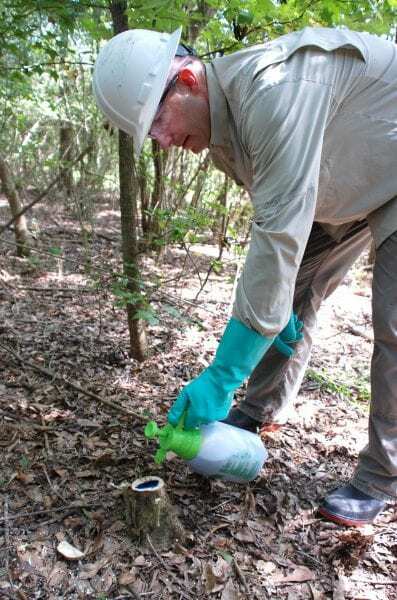 Cut stump herbicide treatments are most easily applied with backpack sprayers or handheld pressurized spray bottles, but they can also be applied with a paintbrush. What stump height should I cut? The best option is to cut close to the ground, leaving a one- to two-inch stump. This avoids leaving taller “ankle breaker” stumps that may be hazardous to walk or drive through. How soon after cutting do I need to apply the herbicide? It is best to treat immediately after cutting, within a few minutes at most. Delays in treating may reduce effectiveness. What herbicide should I use, and how much should I mix? Many stores have two effective herbicide active ingredients available for homeowners. These are glyphosate and triclopyr. Products may vary in the concentration of these active ingredients, so look closely at the label. Ready-to-use glyphosate products with less than 20 percent active ingredient will not consistently work for cut stump treatment. Glyphosate products with 20 percent active ingredient can be effectively used but should not be diluted. The most cost effective option for larger projects, however, is to use a glyphosate product that has 41 percent or higher active ingredient. For the 41 percent or higher glyphosate products, mix an equal amount of herbicide with water to make a 50 percent solution. This is often expressed as a 50 percent v/v or vol/vol solution. Ready-to-use triclopyr products with less than 8 percent active ingredient will not consistently work for cut stump treatment. Triclopyr products with 8 percent active ingredient can be effectively used but should not be diluted. For either glyphosate or triclopyr, a small amount goes a long way when treating stumps. Start with a pint or quart of herbicide product or solution. Adding a spray indicator, such as a colorant or dye, may be useful to see what has been treated. 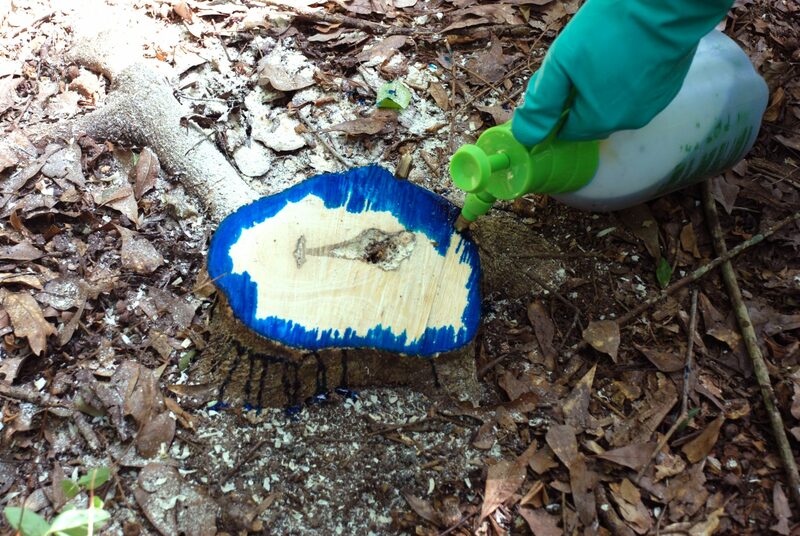 The easiest approach is to carefully spray or paint the entire stump top with the herbicide after cutting. The most critical area of the stump top to cover is just inside the bark around the entire circumference. This is where the herbicide is most effectively transferred to the roots. If using a pressurized sprayer, maintain a very low pressure to avoid puddling and waste. Will rain just after treatment reduce effectiveness? Yes. Cut stump treatments should not be done when rain is expected within 4 to 6 hours. What safety gear should I use when doing cut stump herbicide treatments? Safety precautions must be taken for both cutting and herbicide treatment. 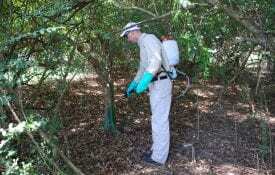 Always follow the herbicide label and use the required personal protective equipment. Avoid leather gloves and leather boots when applying herbicides as they will readily adsorb many herbicides. Use eye protection at all times when doing cut stump treatments. Download a PDF of Cut Stump Herbicide Treatments for Invasive Plant Control, ANR-1465.